Heavy smog, said to be “as thick as the 1952 Great Smog” that caused the illness and deaths of thousands of people in London, has shrouded Beijing in the past few days. 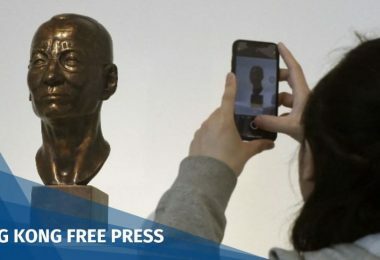 Landmarks in the Chinese capital, historic and modern alike, have disappeared in the blanket of grey, prompting netizens on social media to compete against each other in outlining iconic buildings which are all but invisible. 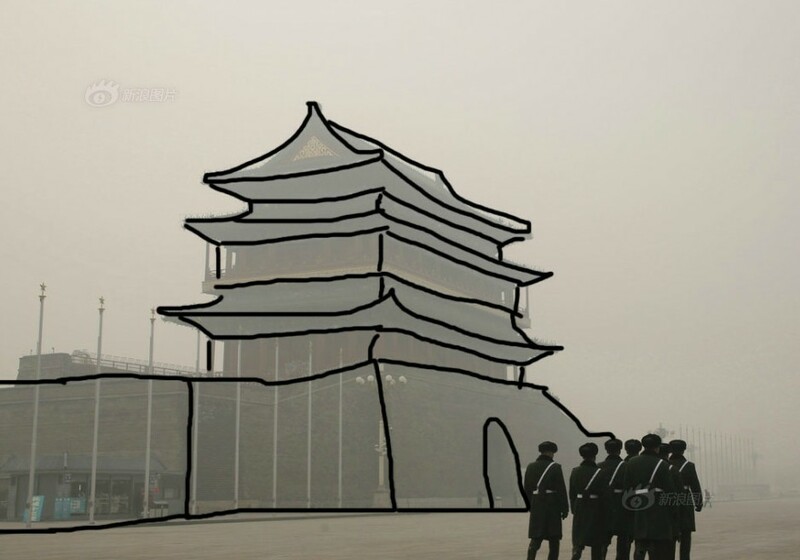 The Qianmen Gate from Ming Dynasty disappears in smog. Photo: Sina News. 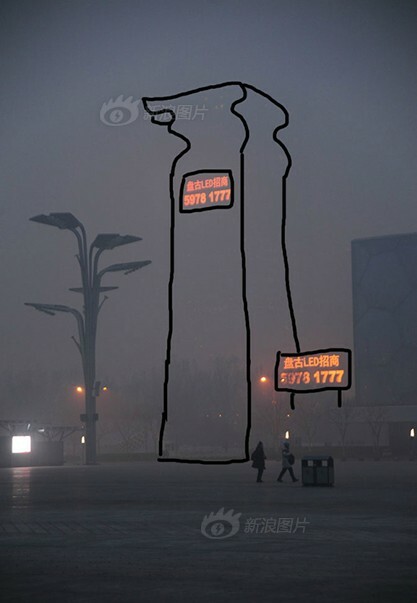 Authorities issued an orange smog alert, the second most serious after the red alert, on Monday. The Central Meteorological Station said heavy air pollution was expected to affect many parts of northern China. 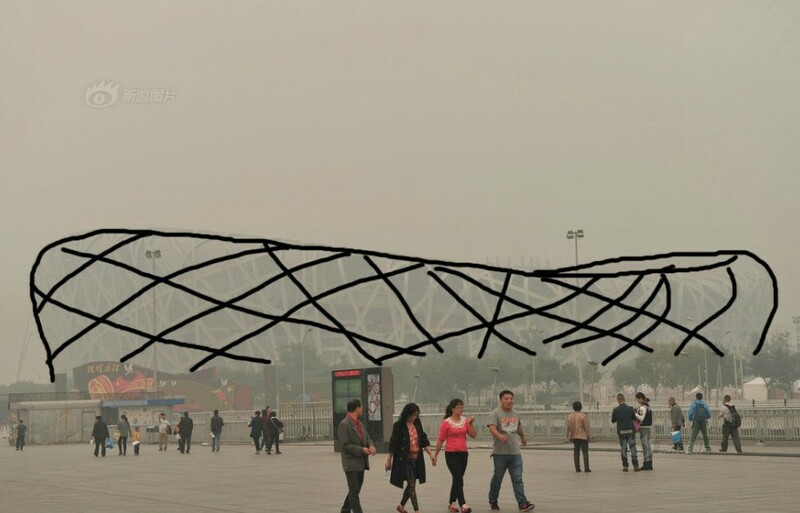 Beijing landmark the “Bird’s Nest” disappears in smog. Photo: Sina News. The dense smog has shut down highways and schools. Thousands of people have been stranded in airports in Beijing, Tianjin and Xi’an. 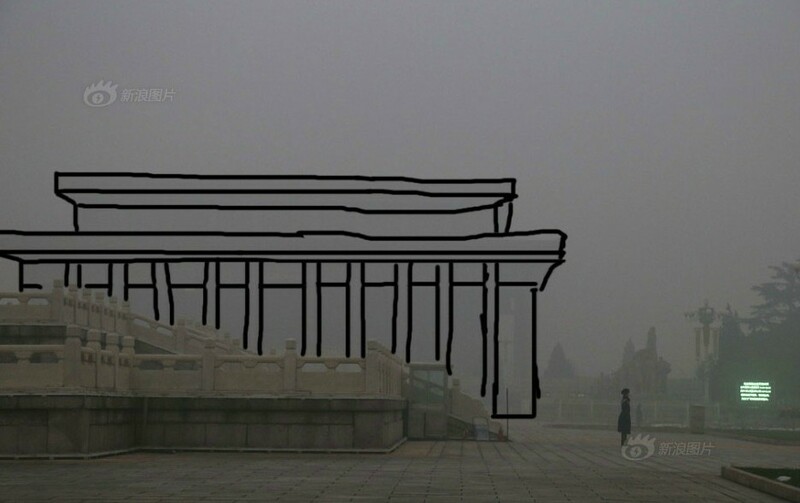 The Mao Zedong Memorial Hall disappears in smog. Photo: Sina News. The level of PM2.5, particles smaller than 2.5 micrometers and therefore able to travel deeper into human lungs, reached close to 1000 microgrammes per square metre in parts of Beijing on Monday. 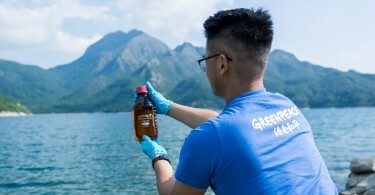 Such a high density is estimated to be “about the same level” as the 1952 air pollution event which plagued London, a scientist from the University of California, Los Angeles, told Caixin. 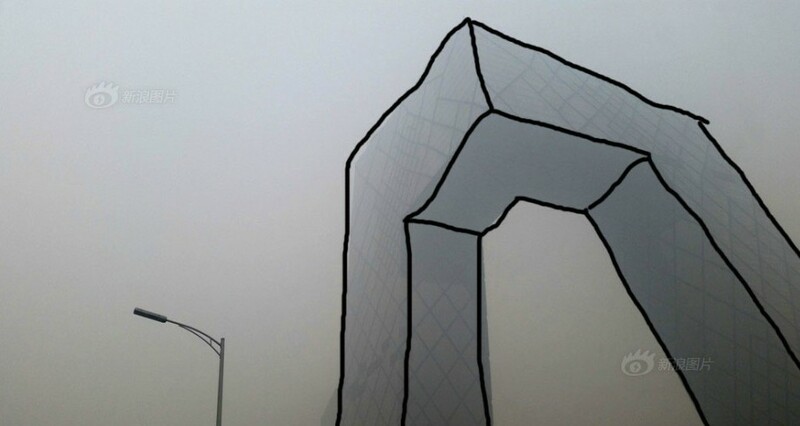 CCTV Tower disappears in smog. Photo: Sina News. According to the World Health Organisation’s 2015 air quality guidelines, human beings are advised to live in an environment in which the PM2.5 level averages 25 microgrammes per square metre over 24 hours. 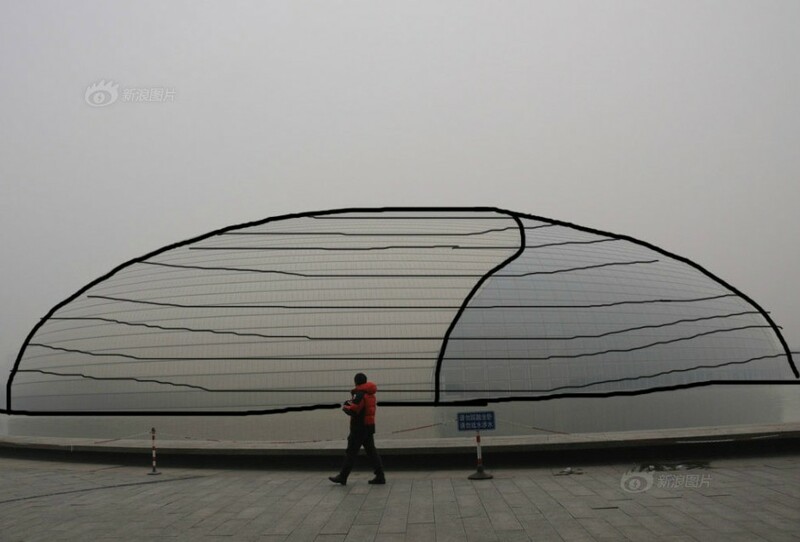 The National Centre for Performing Arts disappears in smog. Photo: Sina News. Ironically, Beijing was named the “most livable” city in mainland China in August this year by the Economist Intelligence Unit. 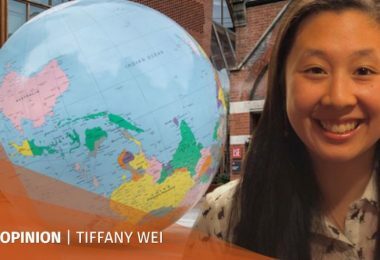 The Chinese capital was ranked 69th globally. 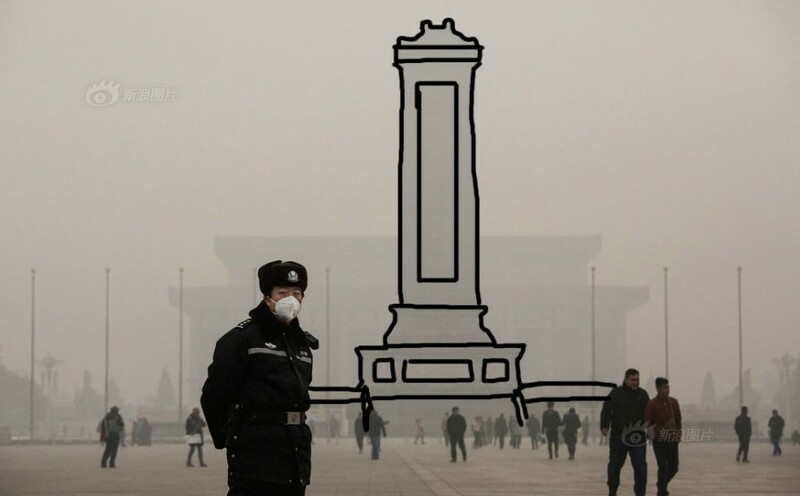 The Monument to the People’s Heroes disappears in smog. Photo: Sina News. The Chinese authorities have stepped up efforts to battle air pollution since heavy smogs in the spring of 2013 sent hundreds to hospitals with respiratory and circulatory system diseases. 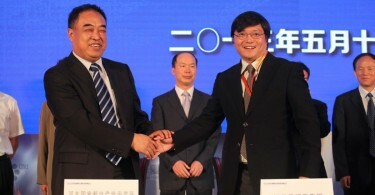 In 2014, Beijing mayor Wang Anshun famously “swore on his life” that he would fix the city’s air pollution problem after announcing RMB760 billion (HK$921 billion) to fund the effort. A building next to the Olympic Park disappears in smog. Photo: Sina News. 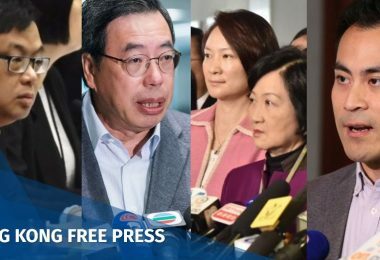 However, even though the authorities acknowledge the problem, public discussions on the issue are tightly controlled. 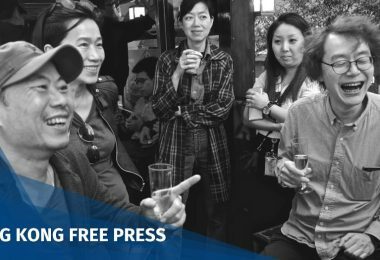 In February this year, veteran Chinese journalist Chai Jing released a documentary called Under the Dome which examined the smog problem. 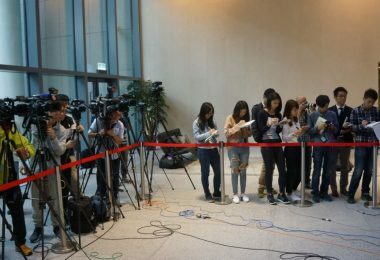 The video was viewed nearly 200 million times in 48 hours, according to search engine Baidu, before authorities ordered it to be taken down and media reports about it to be deleted.